Dunked in the Deep begins with a Soviet spy listening to the radio talking about stolen documents — while he’s preparing to hide the microfilm of the stolen documents into three watermelons. The Three Stooges (Moe, Larry, Curly) visit, only to be told that Borscht is leaving the country that night — and he asks them to bring the watermelons to his ship later. After a farewell drink (that stains the desk and curls the wallpaper), they leave — and we next see them at the pier with the watermelons. 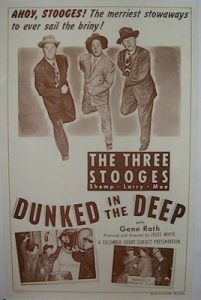 After some tomfoolery (Moe accidentally hitting himself with an egg while Larry and Moe try to crack Brazil nuts on a crate full of blasting caps), the Stooges meet Borscht, who’s hiding in one of the ship’s holds — and the ship leaves with them still on board — all four are stowaways. Borscht slices sausage, and refuses to share with the Stooges — but after hitting the table hard enough to launch slices of sausage into the Stooges’ mouths, Shemp substitutes gears — which Borscht eats. Moe blows some pepper in Borscht’s face, and the Stooges take the opportunity to escape with the sausage. Eating it on the high seas gives them seasickness, and gives Shemp a chance to clown around with an open porthole and getting soaked by the ocean. Later, they try to sleep, with Shemp having a battle of wits with a hammock — which the hammock wins, thanks to a carelessly thrown match and a barrel of burning paper. Morning comes, with slapstick and hunger — and the Three Stooges decide to eat Borscht’s watermelons, with Larry temporarily stuck under the sleeping Borscht’s head. Upon opening the watermelons, Moe and Shemp discover the stolen microfilm — which Borscht overhears. 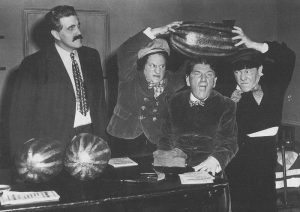 A typical Three stooges chase fight occurs with Moe and Larry knocking themselves out, while Shemp antagonizes Borscht into chasing him – a very funny scene, as Shemp eventually stands back and watches Borscht chasing himself. Eventually, Moe and Larry recover, and Moe manages to knock out Shemp and Larry before finally knocking out Borscht. The short film ends with Shemp being outwitted by the porthole once again, being hit in the face with mud — he’s spotted land! Dunked in the Deep is a good Shemp-era Three Stooges short film, later remade as Commotion on the Ocean. Larry: We’re known as the fish market duet. Moe: The fish market duet? Shemp: Yeah, we sing for the halibut. Shemp: [eating sausage] Delicious! I only wish I had some whipped cream! Dunked in the Deep was reworked in 1956 as Commotion on the Ocean using ample stock footage. The voice heard on the radio broadcast is Moe Howard. Shemp Howard accidentally cut his hand on the lock when he rushes to the door in an effort to open it. Hiding microfilm in watermelons is an allusion to an actual event from the previous year. In 1948, Time managing editor Whittaker Chambers, a former Communist spy-turned government informer, accused Alger Hiss of being a member of the Communist Party and a spy for the Soviet Union. In presenting evidence against Hiss, Chambers produced the Pumpkin Papers: four rolls of microfilm of State Department documents, which Chambers had concealed in a hollowed-out pumpkin on his Maryland farm.